(FreshAsFrankie) Multi-platinum rapper and “Power” executive producer 50 Cent has three brand new shows coming to the Starz network. Despite having some issues with the station that houses his breakout hit drama, it seems that their relationship is in good enough shape to deliver three new series produced by 50 Cent. “LOL yo this sh*t is unbelievable, I have 3 new shows coming on STARS, BMF, Tomorrow Today, and I GOT AWAY. TICK, TICK BOOM. #50centralbet,” wrote 50 in a recent Instagram post. 50 Cent’s “Power” is the highest-rated show on the Starz network, so it makes sense that they are delivering more content from the rapper. However, their relationship has been a bit rocky during the past few months. 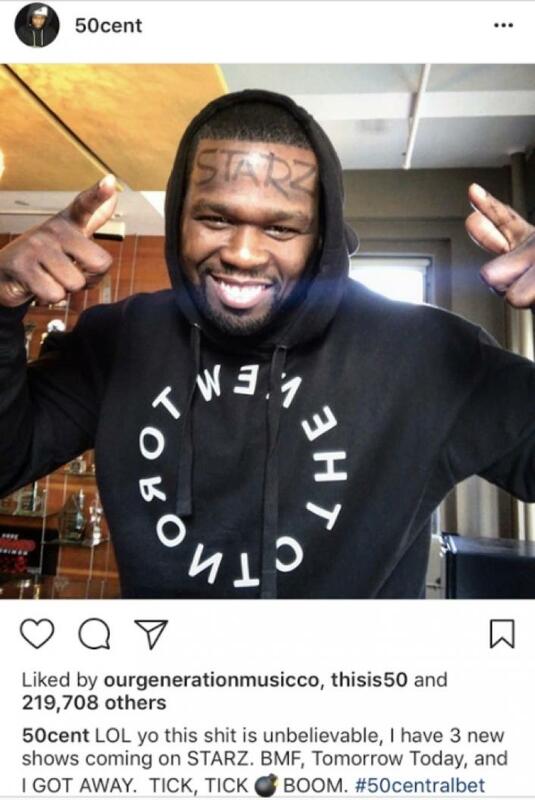 50 Cent took to Instagram back in July to blast Starz for not giving the show extra episodes in this past season. “I woke up feeling a little different about POWER this morning,” wrote 50. “If the biggest show on your network doesn’t mean anything, what does your network mean STARZ? I’m taking my talents to south beach f**k this.” Based on Starz decision, the “Power” team was forced to cram a lot of storyline into its normal 10 episode season. The back and forth between 50 Cent and Starz eventually led to the rapper allegedly leaking an unaired episode online. He once again hopped on Instagram to let the public know that he was behind the leak back in mid-August. “POWER Ratings up another 10 percent for episode 408. They glad I leaked the sh*t now. LOL #SAVAGELIFENow watch what I do on BET,” he wrote with a hash tag promoting his upcoming BET late night talk show. Television seems to be 50 Cent’s main focus these days with 5 shows on the horizon. One of which includes the long-awaited BMF series which he obtained the rights to a few years back.